We offer photo booths, face painting, balloons, glitter tattoos, henna, makeup, and airbrushing! Tamariel Paints uses only professional products to provide professional grade sparkle to your event. Tamar did Henna at our end of the year school event for the second year in the row. 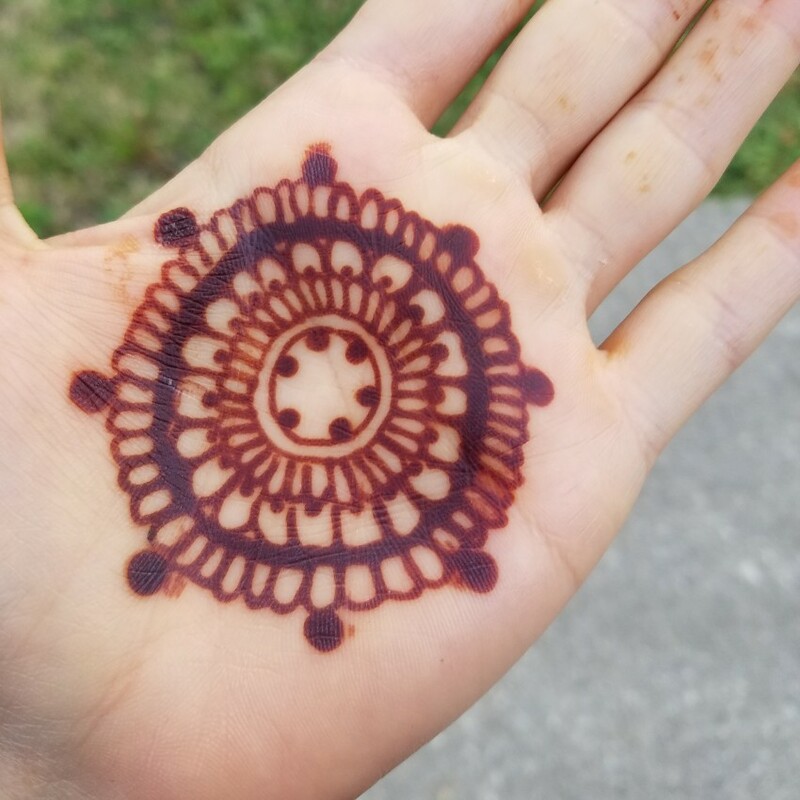 She worked quickly and beautifully in order to allow dozens of our students enjoy Henna within a short time period. Tamar went above and beyond by insightful and helpful feedback for future events. Thank you! The face-painting at my niece's 4th birthday part was beautiful! The flowers, butterflies, spidermen, tigers, etc that artfully covered each child's face was the highlight of the party. Tamariel Paints was able to effectively organize and entertain the children at this hot, outdoor event, and each child LOVED their painted face. The added glitter feature made the henna experience so pretty. Our kids LOVED it, and the line for her service was endless. I hired Tamariel Paints for my daughter's 1st birthday party. Tamar was very professional and warm and welcoming to the kids. Some adults even got painted and had just as much fun! Her work is unbelievable. All the guests were just raving about her and how she didn't just use plain face paint; she used glitter paint and glitter to make it extra special. We HIGHLY recommend her! Thank you Tamariel Paints. Amazing \ Beautiful Face Painting!!! 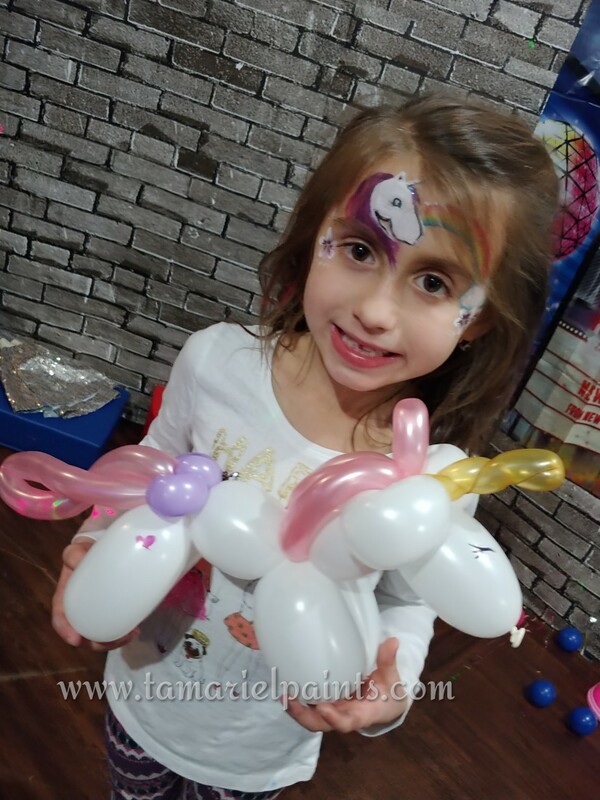 I just threw my son his 5th birthday party and I am so happy I hired Tamariel Paints for face painting kids and adults. Her work is awesome. Every design requested by the guests left a big and bright smile on their face!!! Not only were her designs an “A+”, the quality of makeup she uses was great (easy to wash off) and she is VERY reliable and flexible. I definitely recommend that all parties considering a face painter use her services. My name is Tamar and I am a face painter, mica and henna artist. In addition to my repertoire of extraordinarie faces I have a background in child development (Master's degree in child development, anticipated graduation date of 2013) and I am comfortable working with children with a variety of special needs. I first began face painting when I spent a magical summer in the art department of a camp for children suffering from cancer. Since then I have taken classes and learned from some of the most renowned names in the face painting world today: Lynne Jamison, Annie Reynolds, Margi Kanter, Marcela Murad, and Pashur. Because of my background in working within the medical and education world I value hygiene and safety. I use top-of-the-line, non-toxic, FDA compliant cosmetics and glitters. 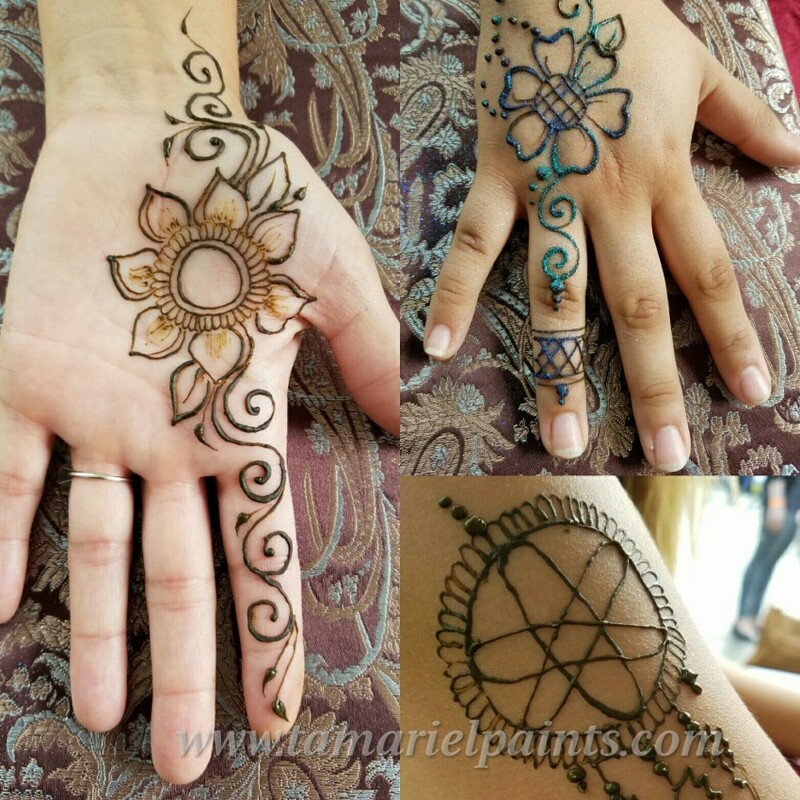 When providing henna services I use ONLY body art quality henna -- NEVER DANGEROUS BLACK HENNA (PPD) or chemical fakes! I am able to work with you for special requests and themes in order to ensure your guests have the best experience possible. Should you need more than one artist at your event I am happy to provide! Need more than 2 artists? Look no further! 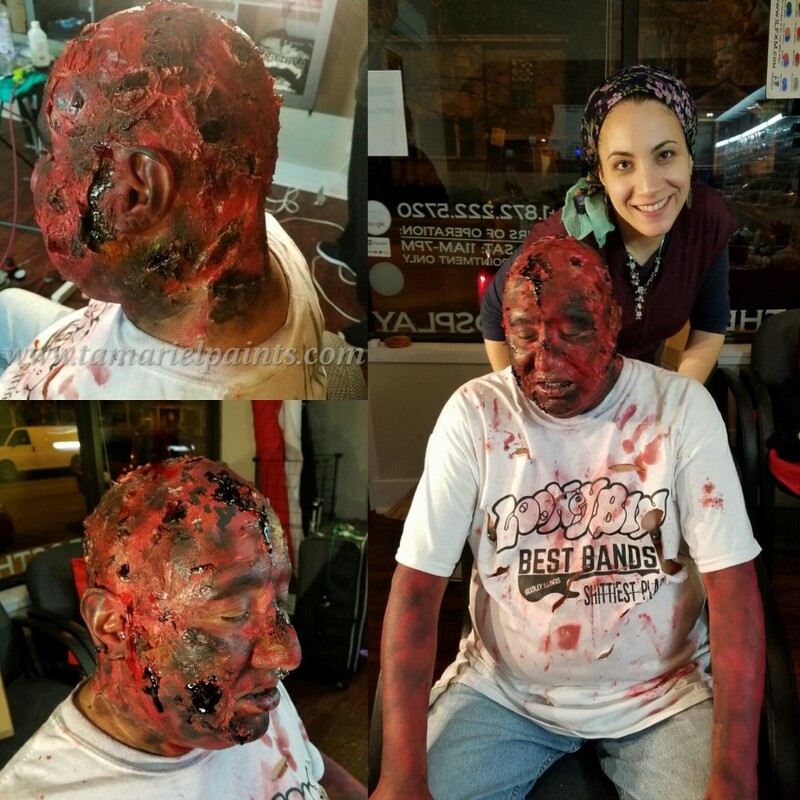 I can bring up to one face painter and 2 mica tattoo artists for an event. My assistant, Leah, has over ten years of experience in working with children! She can provide gorgeous mica art and help tame any line. My line manager and second mica artist, Ariel, began his career at UIC's school of Art and Architecture. He too is comfortable working with children of all ages. Special discounts are available when booking for longer than 2 hours! Further discounts are available if hiring for half-day (5 hours) or full day (9 hours) of work! Costume Characters (Princess/Fairy) available by special request! Photo booths require a 10x10 foot area and access to electricity.